Some publishers attempt to solve this problem strictly with creativity. While creativity is a component of high-performing content, it’s not the only factor to keep in mind. Another way to win attention in noisy social feeds is by being highly relevant. In order to stand out, it’s important that posts reach the right segments of an intended audience. This is why audience targeting has become a necessary and effective component of successful social media publishing. When paying to promote content, Facebook, Twitter and LinkedIn provide extremely robust targeting capabilities that enable publishers to define their reach through a bevy of demographic, user type and interest-level categories. However, social media targeting is not a strategy that should be solely supported by a media budget. Most social networks allow publishers to apply a level of targeting or custom visibility to organic posts. 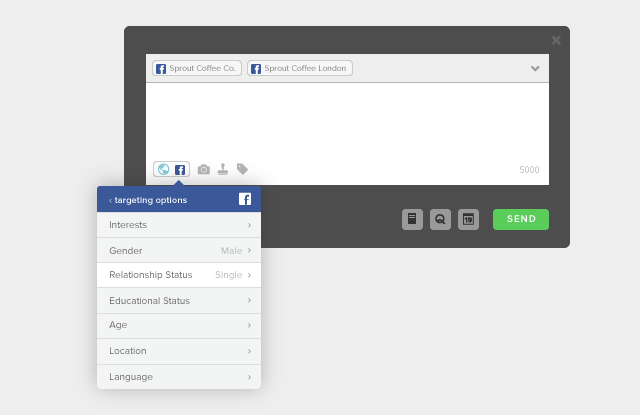 Setting custom visibility through Sprout Social’s available targeting criteria can increase engagement rates and provide a more relevant experience for your reader. 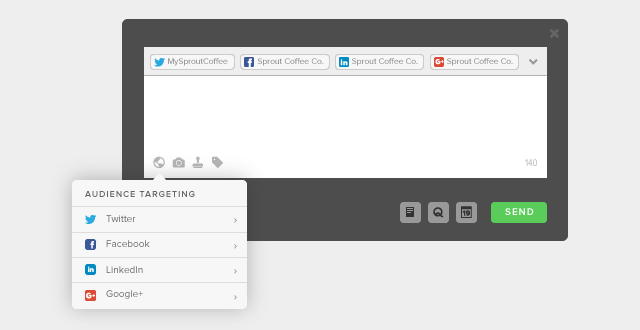 Sprout’s publishing tools make it easy to schedule, queue and post messages to multiple networks simultaneously and leverage unique social media targeting options for each individual network—all from a single intuitive Compose window. This is really powerful. Not only does Compose centralize your social media publishing efforts, saving you time and ensuring a consistent voice across networks, but it also allows you to deliver the most relevant messages to targeted segments of your communities on each network. 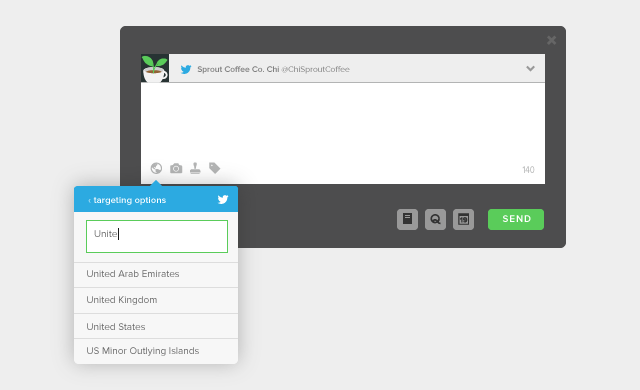 To access the Audience Targeting options, simply click the globe icon in the lower left corner of the Compose window. 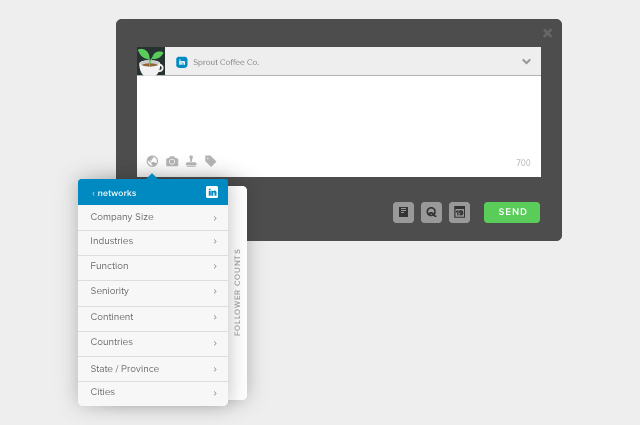 The menu will intelligently populate with only the networks that correspond to the profiles to which you have selected to publish. Sprout’s Audience Targeting capabilities are available to our Corporate and Enterprise users who are serious about targeting. If publishing targeted messages is part of your social media publishing strategy, no matter the size of your team or the audience you’re trying to reach, Sprout can help you achieve your goals. The Facebook News Feed has become a crowded space. With the ever-changing Edgerank algorithm, ensuring a healthy reach can feel like a constant battle. Through organic Facebook Page post targeting (formerly News Feed targeting), smart publishers have found new ways to optimize their organic reach. Unlike limiting your Facebook post’s audience (detailed below), organic Facebook targeting only affects what a user sees in their News Feed. In other words, regardless of whether a user fits the targeting criteria, the post will still be visible via Facebook search and while visiting your Page directly. As digital marketing expert Neil Patel stated on QuickSprout (no affiliation): “I’d rather reach a large portion of a small audience than a small portion of a large audience.” Maximize the reach of your posts by targeting content to smaller, sub-categories within your audience. An entertainment media company uses a combination of interests, age and gender to target each of its articles to a segment of its readership that is most likely to engage with the content. A food delivery service uses location and educational status to share promo codes with current college students in targeted regions. A global hospitality chain targets honeymoon themed posts to soon-to-be newlyweds using a combination of location, age, gender and relationship status criteria. A national publication geared towards retirees uses age, location and interests to target its content to the the most relevant readers. In using organic Facebook targeting, you are providing a portion of your audience with content that resonates with them. Therefore, these users are more likely to engage. Once a user engages with your content, that user’s Facebook Friends have the opportunity to see your post even if they do not like your Page or do not fall within specified audience. This is how organic Facebook Page post targeting can have a catalytic effect on a post’s organic reach. While putting promotional dollars behind Facebook posts and targeting audiences by user type or interest-based criteria can be effective, there’s still a possibility for subjectivity. Plus, putting paid behind every social post isn’t a sustainable or effective strategy. To that end, limiting your post’s audience through Sprout’s Facebook Audience Targeting tools enables you to take two of the most clear-cut audience attributes—language and location—and use them to ensure you’re not wasting impressions on fans who would find your content irrelevant. 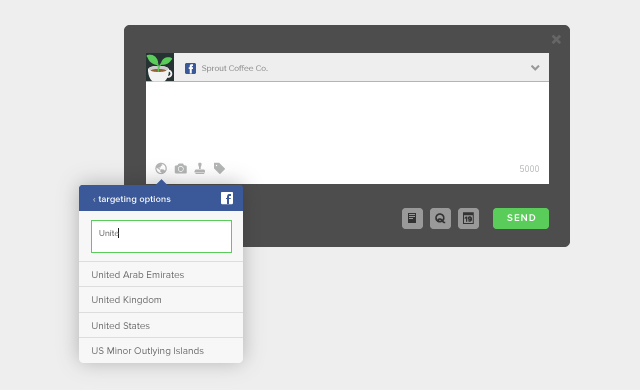 When selecting any of the above, you can start typing the name of the desired target and Sprout’s look-ahead smart search will refine the options in the dropdown menu, making it easy to find what you need. Keep in mind that limiting a post’s audience based on language and location will apply to the visibility of the post across all of Facebook. This means that a Facebook fan who falls into the targeted segment will be able to view that post in their News Feed, via Facebook Search and while visiting your Page directly. LinkedIn has come a long way from being a repository of digital resumes. Today, LinkedIn represents a thriving community of professionals looking to make deeper connections with their peers; it also serves as a robust publishing platform with vast amounts of content. As the overall LinkedIn community has grown—now, more than 364 million members across 200 countries—it has become increasingly important to ensure that your content reaches the right people at the right time. Publishing targeted updates is an effective way to communicate with your LinkedIn followers in a more relevant and personal way. Use seniority or job function targeting to share a job posting with relevant candidates. Share regionally specific company news or information about local industry events, using geography and industry targeting. Download our free guide, “LinkedIn Targeting: Delivering Relevant Content to the Right People,” for actionable insights on how to best align your audience targeting strategy with your overall business objectives. The Twitter community is very much a global one, and in many ways, the platform has been central to breaking down barriers and opening up the free flow of communication—even across borders. At the same time, certain scenarios call for more targeted messaging. Geotargeting organic Tweets can be leveraged to create better experiences for local audiences. A multinational business maintains individual Twitter handles for each market in which it operates; however, it recognizes that the main corporate handle has the largest follower base. This business can leverage geotargeted Tweets from the corporate handle to reach local audiences that may not follow the regional handles. A global brand produces and shares content in several different languages from its main brand Twitter handle. To avoid alienating followers to which localized content may be irrelevant, the brand uses geotargeted Tweets to reach native speakers. It’s important to note that any Tweet published with geotargeting applied will only be visible to users in that country—whether they are viewing their home feed or visiting the Twitter account’s page directly. There’s no doubt that leveraging audience targeting is an effective way to refine your social media publishing strategy. That said, it’s certainly not the only way to ensure that your messages are organically reaching the right audience. A carefully crafted employee advocacy program enables you to tap into a unique and powerful targeted community: your employees and their trusted networks. Similar to audience targeting, employee advocacy represents another strategy to reach a highly relevant audience and, when executed effectively, can have a meaningful impact on the overall spread of your brand’s content. Patrick Cuttica: Prior to joining Team Sprout as Product Marketing Manager, Patrick was an avid Sprout user while managing several brand accounts for a Chicago-based digital marketing agency. When he's not obsessing over all things social media, Patrick can be found playing with his dogs or stand-up paddleboarding—or both!